Arranging your books by color Is not a moral failure. 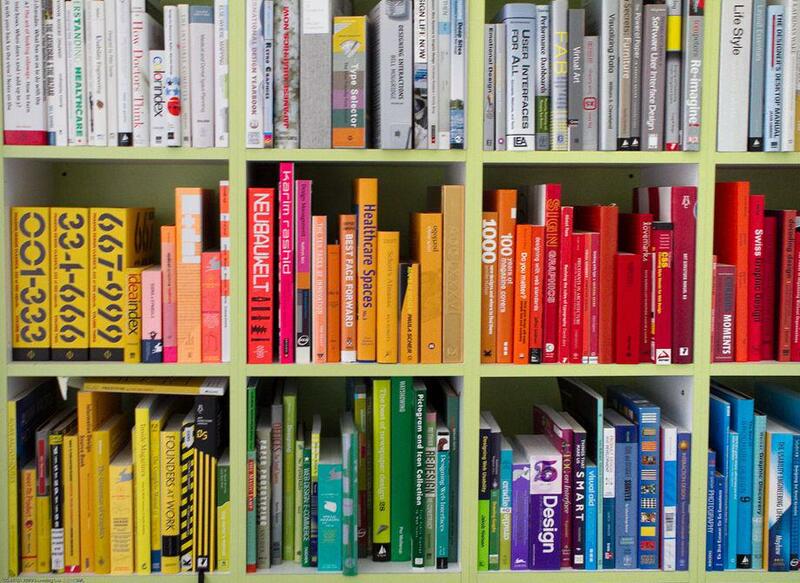 Interaction designer Juhan Sonin’s color-organized bookshelves. I sometimes moonlight as an interior designer, which gives me insights into how easily people let style trends (and worries about which ones are hot or not), distract them from the essential task of figuring out how they want to live. Recently when I helped decorate a new Brooklyn loft for a young family, we found a spot to build shelves for their pared-down collection of books. After we built the shelves, the husband sheepishly mentioned that he sort of liked the idea of arranging them by color and wondered if it was lame. I told him that when I first saw a bookshelf organized by color several years ago, I thought it looked fresh, promptly rearranged my books accordingly, and was pleased with the result. Because not every green-covered or yellow-colored book is the same hue, it had a more subtle effect than I expected, and I had fun figuring out how to mix the color blocks and how to arrange my many predominantly black and/or white books (I settled for black on the bottom, white on top, colors grouped roughly by position on the color wheel in between). Guests did double takes and smiled when they saw my bookshelves. I did too. Then—since I am also someone who pays too much attention to interior decorating micro-trends—I started noticing color-coded bookshelves everywhere, and wondered, as people do, if I had fallen prey to an overdone fad, if color-coded bookshelves had become as clichéd as wall-mounted antlers or granite counter tops. But eventually I decided that I didn’t care. And neither should you. Those who are opposed to color-organizing bookshelves argue that it’s impractical, claiming they couldn’t possibly find anything that isn’t categorized by title, author, or subject in their apparently vast collections. To them, the color-organized bookshelf is a self-conscious triumph of style over substance. Or as one of my favorite interior design–related Tumblrs puts it: F–k your bookshelf with the books arranged by color. But there is much to recommend the rainbow-hued bookshelf. For one thing, it looks pretty. And though it might look stylized, using color as an organizing principle actually lends it a random, serendipitous quality that has much in common with the disheveled bookshelf beloved of old-school academics too busy reading books to organize them. For another, let’s dispel the notion that everyone with a book collection needs a rigorous system to locate any given book at any given time in order to pull it from their shelf and pounce upon an important fact, passage, quote, or other tidbit that for some reason could not be Googled. Owning physical books was once an imperative for those who wanted knowledge and information at their fingertips, but the reflex to acquire, preserve and catalog books is mostly grounded in a dated reality. And who’s to say that color isn’t a perfectly viable visual cue to help locate a book you want to revisit? In its 2012 “In Defense of: Organizing Books by Color,” Apartment Therapy argued that “traditional organization methods like alphabetical by author, fiction/non-fiction or subject matter don’t work for everyone,” adding that “visual thinkers” might remember the bright blue cover of the novel they read last summer, rather than who wrote it, or its title. Surely those who judge the color-coded bookshelf as a sign of fashion-conscious frivolity must acknowledge that the bookshelf itself has always been a trophy case of sorts. The display of one’s literary conquests is a deliberate exercise in broadcasting who we are to those who would parse our shelves for clues (when they’re not rifling through our medicine cabinets). A bookshelf is not only a place to house cherished books but a way to telegraph our ambitions, often lined with titles we have acquired and believe would enrich our lives were we to crack them open one day, or had they changed us more when we did. In the end, organizing your books by color is the kind of harmless DIY decorating experiment you can try and take back, even less of a commitment than painting a wall. It might even get you to take a closer look at a book you haven’t touched for ages, or one you always meant to get around to starting, instead of wasting time obsessing about bookshelf design.